Three people were injured in a shooting and crash on Chicago's South Side Wednesday afternoon. 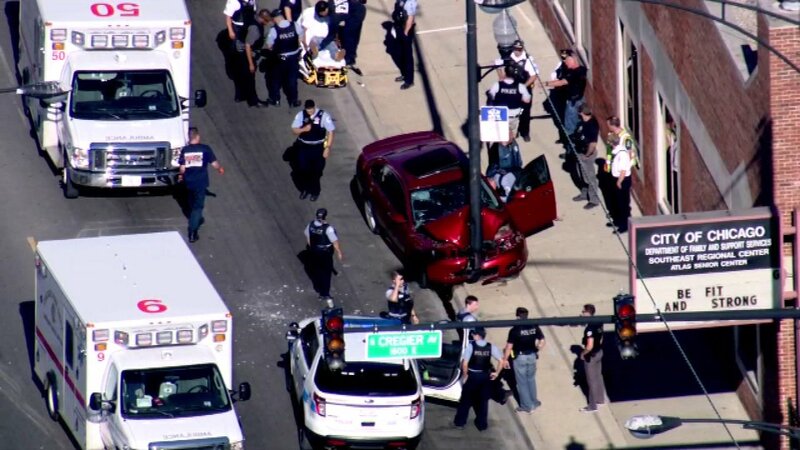 CHICAGO (WLS) -- Two people were killed and another was wounded in a shooting and crash on Chicago's South Side Wednesday afternoon. Police said someone in a passing vehicle fired into a red Chevy Impala, causing the driver to lose control and crash into a pole in the 1800-block of E. 79th St.
Police said a 20-year-old man who was shot in the face was pronounced dead at Northwestern Memorial Hospital. He is a documented gang member, police said. Police said a 25-year-old woman also suffered a gunshot wound and was pronounced dead at Advocate Christ Medical Center. A second man suffered non-life-threatening injuries due to the crash and is also being treated at Advocate Christ Medical Center, according to police.